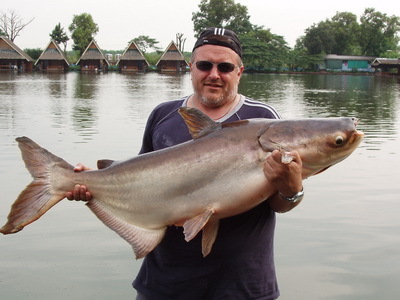 Australian angler Craig visited Thailand for a short fishing holiday and began his trip with a visit to Bungsamran Lake in Bangkok fishing for Mekong Catfish. On arrival at Bungsamran Lake Craig was soon set up on the public bank and wasted no time in casting out large balls of groundbait on sliding float presentations. After both floats splashed down in the central area of the lake it was not long until one burst into life as it skipped across the surface before burying itself under the water. On winding down into the unseen catfish the rod took on its full parabolic curve as the Mekong Catfish powered off towards the far side of the lake. The Mekong Catfish gave a good account of itself fighting strongly for at least ten minutes out in open water before it was ready for netting. On hoisting the Catfish onto the mat the fish was estimated to weigh 25 kg’s and was photographed before being released back into the lake. Further casts resulted in more Mekong Catfish of a similar size which battled equally as hard and testing the angler’s physical endurance. As the days fishing at Bungsamran Lake continued Craig started picking up slightly larger fish with several specimens nudging the 30kg region. Later in the afternoon another screaming take heralded the beginning of another grueling battle which saw the angler attached to the Mekong Catfish for almost 15 minutes. The Mekong Catfish on this occasion as estimated to weigh 30kg+ and was proudly displayed for the camera for trophy shots. As the days fishing in Bangkok wore on Craig added yet more Mekong Catfish and Striped Catfish to his rapidly increasing haul. At the end of the days angling Craig had amassed a fifteen fish haul consisting of mainly Mekong Catfish to over 30kg’s in addition to a few smaller Striped Catfish.